← Kent, UK. February 22nd, 2016. Norhausen, Germany. February 22nd, 2016. 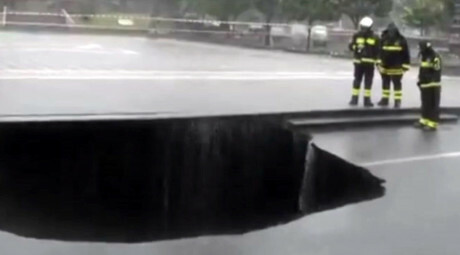 A massive 50 meter deep sinkhole has swallowed up parts of two uninhabited buildings in a German town. Luckily no one was injured in the incident. The hole continued to grow over the weekend. According to local authorities, the earth began to swallow the district-owned service company in the city of Nordhausen on Friday night. Witnesses said they heard a rumbling before two sinkholes opened up, engulfing parts of two buildings. The dual ground openings eventually merged to form one large crater, measuring 50 meters deep and 30 meters wide, that has since been filled with groundwater. Part of an office building and an outbuilding broke off and plunged into the depths unexpectedly. Now both buildings are in danger of collapsing. The authorities cordoned off the site of the disaster and are investigating the cause of the sinkhole. Experts of the State Mining Authority and the Thuringian State Institute for Environment and Geology (TLUG) are responsible for the probe. According to officials, a much smaller sinkhole was found near the site six years ago. This coming Monday the District Administrator Matthias Jendricke (SPD) will meet representatives of the Nordhausen fire department and other services to discuss further steps to deal with the sinkhole and the surrounding structures. This entry was posted in Pictures, Structure v Sinkhole and tagged Germany, sinkhole. Bookmark the permalink.